DA Form 5906-r - also known as the "Diversion Decision Considerations-major Items Less Ammunition" - is a Military form issued and used by the United States Department of the Army. The form - often mistakenly referred to as the DD form 5906-r - was last revised on August 1, 1990. Download an up-to-date PDF version of the DA 5906-r below or request a copy through the chain of command. 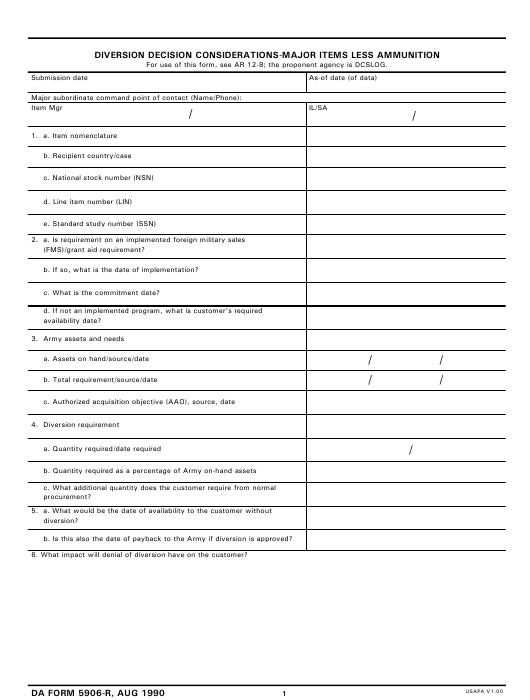 For use of this form, see AR 12-8; the proponent agency is DCSLOG. b. If so, what is the date of implementation? c. What is the commitment date? b. Is this also the date of payback to the Army if diversion is approved? 6. What impact will denial of diversion have on the customer? ment, training equipment, ammunition? If so, give details. above) be met from ongoing production? b. By inclusion in planned future production? d. If so, what is the minimum order quantity? e. When is it estimated to be accumulated? f. Can the requirement be met only by diversion without payback to the Army? 11. Can the requirement be satisfied by diversion from a third-country program? 12. a. Is this order required to help maintain a warm production base? b. If so, how long will it extend production? 13. If diversion is made, what is the recommended sales classification? b. Has there been slippage in meeting the original commitment date? c. If so, explain cause of slippage. 17. Scheduled receipts from production and overhaul (attach DA Form FFFF-R).